In a week’s time our favourite pic-a-nic stealing bear ever will be coming onto the big screen from 11th February with his brand new film,Yogi Bear! And on top of that, he’s going to be in 3D too! 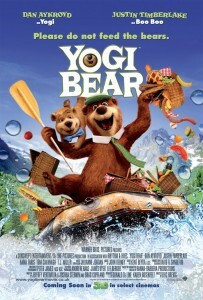 For all us many Yogi fans, we can enjoy a brand new adventure with Yogi (voiced by Dan Aykroyd) and his faithful pal Boo Boo (voiced by Justin Timberlake) with their never-ending schemes to separate park visitors from their lunches. However, in this new 3D film Yogi Bear, the pair of them are having to do a lot more than try and steal lunches, as Mayor Brown plans to sell their Jellystone Park to loggers. Facing this challenge, Yogi and Boo Boo have to team up with their nemesis Ranger Smith to find a way to save the park and prove that Yogi really is ‘smarter than the average bear’! Yogi Bear uses a mix of computer graphics and live acting to create a really entertaining film that is ideal for both those who loved the cartoon and also for those meeting Yogi for the first time! Yogi Bear comes to UK cinemas from 11th February.